Watching the hurricane sweep through the Coastal Bend from her home in New York City, part-time resident and artist Nancy Ray Taylor, was naturally first concerned about her Rockport home and studio. Arriving in town three days after the storm passed through, Nancy discovered that while her studio was destroyed, her house was fine. Knowing her home was secure, Nancy next wanted to "help serve the community." Since she could not clear damaged trees and debris, she decided to paint. Heartbroken to see that the Blue Crab was gone, and realizing that souvenir-takers were even picking clean the pieces, Nancy decided to replace the Crab, at least temporarily, with a painting. The original Blue Crab at Rockport Beach was made of paper-mâché and chicken wire (see bottom of article for images). It sat on the roof of a local restaurant, the Del Mar Grill, located in downtown Rockport, and was noted as the World's Largest Blue Crab, according to Roadside America. 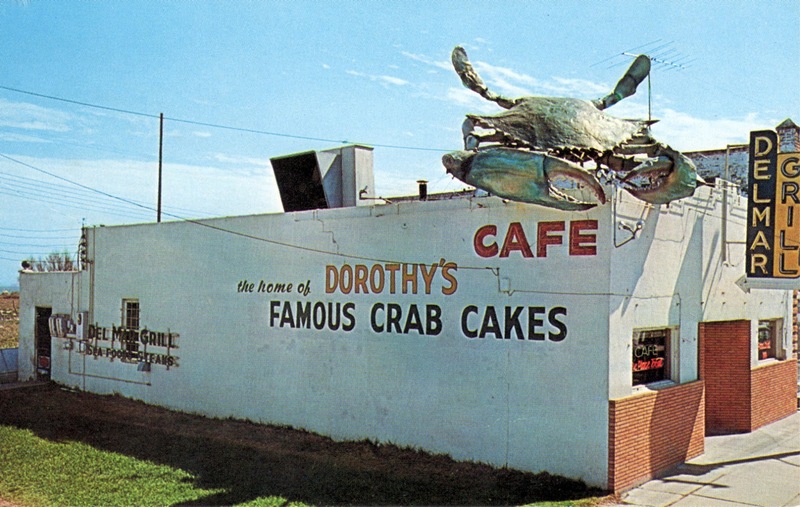 The restaurant closed in 1965 and in 1966 its crab was moved to Veteran's Memorial Park. In 1976, after being battered by hurricanes that deteriorated the structure the crab disappeared, and is allegedly buried somewhere in Rockport. 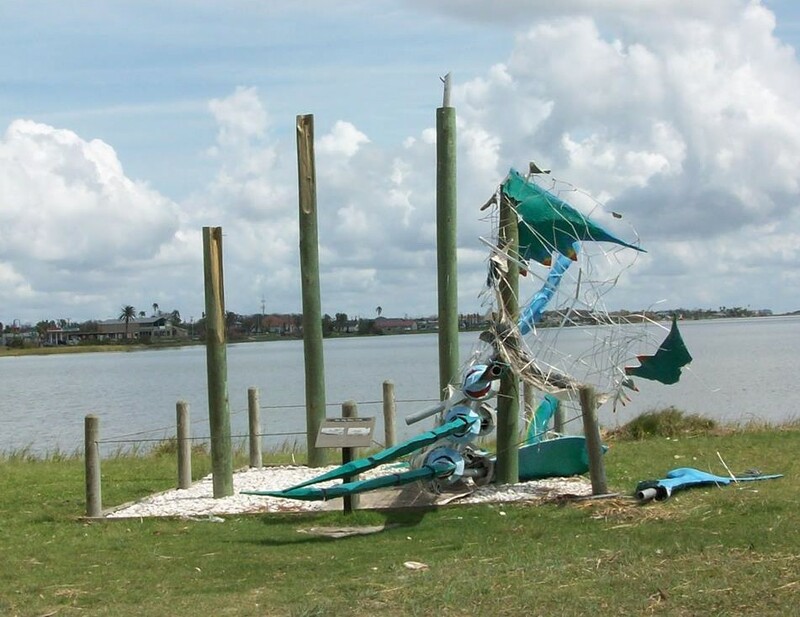 Although gone, the symbol which has become an icon for Rockport, was not forgotten and a “Save the Big Blue Crab” group "raised money for a new, bigger and better crab," according to documents in the History Center for Aransas County. The Blue Crab rose again, built by local artist David Allgood out of aluminum and fiberglass in 2012. A winter Texan had unknowingly repainted the original crab to be a female blue crab and Allgood followed that pattern, although he knew it was biologically incorrect. Measuring 27 feet by 25 feet, the work of art was refurbished in 2017, only to be destroyed by Hurricane Harvey a few months later. The Crab is watching you! Harbor Master Keith Barrett says he is asked at least "ten times a day" whether there will be a Big Blue Crab #3. He would like to see it rebuilt and views Nancy's rendition of it as part of the area's healing process. 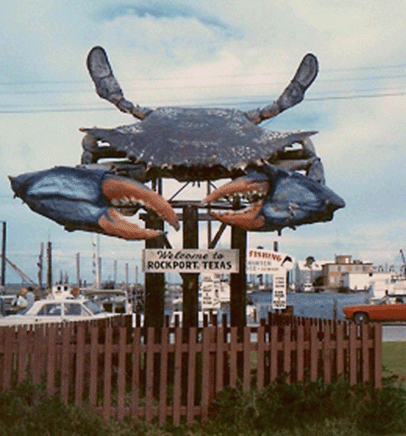 Barrett noted that almost every visitor to Rockport, as well as locals and school children on field trips, has had their picture taken in front of the Blue Crab. From his office, which faced the crab, he would see visitors taking photographs about every twenty minutes throughout the day and he frequently stepped outside to assist in taking a group photo. Barrett also remembers going to both the original location and Veteran's Memorial Park to have his photograph taken as a child. So far a few groups have talked about raising funds to resurrect the Crab, but there are currently no concrete plans. Hopefully the Big Blue Crab will rise again, but in the meantime, stop by and take a photo with Nancy's creation. So many people have taken photos in front of the Big Blue Crab. Please share them with us for a Blue Crab album. Send your photographs with the original Big Blue Crab or Big Blue Crab #2 to wwnimages@gmail.com. It will be fun to see the art over the years!